Zambia’s neighbouring countries are the DRC (Democratic Republic of Congo), Tanzania, Malawi, Mozambique, Zimbabwe, Botswana. Whether you are looking for market and salary information or up to running a recruitment drive for a large scale projects we have the expertise and tools to assist you. Responsible for providing an efficient and professional maintenance service while reporting to the Engineering Manager. This entails developing, improving and refining the best maintenance strategies for the required equipment and ensuring that these strategies are met. Assessing and directing the process of detect in order to promote proactive maintenance and to adhere to all aspects of legal appointment in terms of the works and mines. The successful candidate will be reporting to the Production Manager. He / she will be responsible for developing process and ensuring plant optimisation through waste elimination and constant improvement initiatives whilst maintaining and promoting the required ISO standards. The successful candidate will be responsible for the overall management, direction and continuous improvement of the asset capability assurance process in a safe manner, through defined strategies and objectives for maintenance of equipment, plant and facilities & shutdowns. The ideal candidate will be using his/her knowledge and skills and apply it within provided Strata Control systems, process, policies, procedures and resources to meet the short-term demands in a defined area as required by the HOD. Our client is looking for a Mine Manager with Project Management experience to drive a newly established quarry operation. Adhering to all legislative requirements by leading, directing and managing the operational and business objectives efficiently. A well established international manufacturer is looking for an experienced Earthmoving Mechanic to join their dynamic team in fulfilling day to day responsibilities in repairing a wide range of machines efficiently to the highest quality. The successful candidate will be responsible conducting risk assessments for assigned audits within the given timeline, assisting in executing of risk based internal audit work and ad-hoc review assignments. The successful candidate will be required to provide technical, functional and integration proficiency for BIS by organizing, designing, building, executing by constantly improvement, supporting and providing coaching across the required technical areas. In working for a established mining company, the successful incumbent will be requested to maintain high standards of safety within the work environment and on the relevant working sites. He/she will be required to oversee the area’s compliance in regards to EHS by conducting assessments relating to risks and inspections to monitor and assess compliance, ensuring employee compliance and risk free environments. Zambia, officially called the Republic of Zambia is a landlocked country in Southern Africa, Africa, and the 39th largest country in the world after Chile. The capital of Zambia is Lusaka. Population is mainly around Lusaka, and also the Copperbelt province. On 24 October 1964, Zambia declared independence from British colonial rule. Zambia was also named the world’s fastest economically reformed country in 2010. Interestingly the Common Market for Eastern and Southern Africa (COMESA) is headquartered in the capital Lusaka. It is no secret that the mining industry is the economic backbone of Zambia. Although Zambia is such a large producer of copper and cobalt in the world, 68% of the population live below the recognized poverty line. Zambia is one of the major producers of Copper and Cobalt in the world. It is the seventh largest producer of Copper and generates around 3.3% of the world’s total production of copper. Zambia is the second largest producer of Copper in Africa. Zambia is the second largest producer of Cobalt coming in at 19.7% of total cobalt mined in the world. Not only does it have large quantities of CI-CO (Copper) deposits but also a wide variety of other metalliferous and non-metalliferous resources. Exploration of copper started as early as the 1930’s, but since then other commodities have been explored and mined. As a byproduct of the mining, and production of copper significant quantities of selenium, silver, gold and platinum are produced. Lead, and Zinc was found in the carbonate-hosted deposits in Kabwe, it ranks as one of the highest zink, and lead deposits in the world. Copper prices dropped drastically in 2015 giving a bleak foresight for mining and producing of Copper in Zambia and the rest of Africa. Mopani Copper Mines is the second largest employer in Zambia after the government. The mine produces of 25% of the total metal output in Zambia. Zambia is facing some troublesome time as the copper makes out 70% of Zambia's export income. Zambia has been plague by a severe drought this in turn brought the power generation capacity of the country to a low. Power cuts have been devastating for the mining sector affecting output severely. 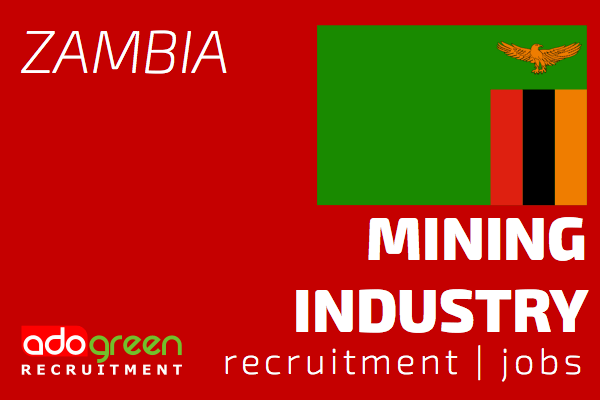 AdoGreen is a specialist recruitment agency focusing on finding local talent in various African countries in the mining industry. Zambia has a high demand on the skilled local workforce. As a client you want to work with an agency who understands the job and recruitment market in Zambia being able to provide insight into your expansion and needs. We have an extensive referral network and have built up trusted relationships and a highly reputable name in the Industry. Why AdoGreen is so effective in working within Southern Africa, being able to target local candidates, is owing to extensive experience in pioneering within unfamiliar locations and successfully identifying the best recruitment practices for these type of environments for expanding and established companies. We put high value on client and candidate relationships.